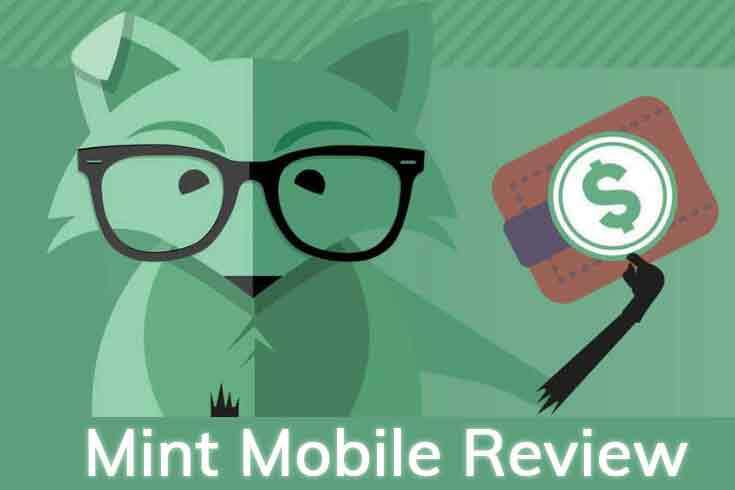 Mint Mobile Review: For $15/Month Is It Worth It? I’ve been using Mint Mobile for a year now – in multiple locations in the US and traveling abroad to more than a dozen countries. Mint turned out to be a great money-saver for me – can it be one for you too? Written by Adam on February 11, 2019. Updated April 24, 2019. 10 min read. Financial Independence. 2 comments. If you haven’t heard of Mint Mobile (previously called Mint SIM), I don’t blame you. I found out about them about a year ago after a Facebook ad was shown at just the right time. At the time I was looking to switch away from AT&T and lower my $100/month bill and was lured in by the idea of only paying $15 a month for cell service. After a bunch of research I ended up signing up for Mint Mobile, where for $25/month I could replace every service I was paying AT&T for. After a year of using Mint – in Florida, Utah, the UK, Scotland, and Southeast Asia – I can wholeheartedly recommend them. I don’t use very many services – Vanguard for investing, Personal Capital for tracking investments, Mint for budgeting, Simple for checking and Mint Mobile for my cell phone service. For me to recommend something enough to write about it, it’s because it’s a core service I use. If you’re hoping to cut costs on your cell phone bill in the new year, I’d encourage you to check out Mint Mobile. Back in 2016, Mint SIM was launched as a “mobile virtual network operator” (MVNO) under Ultra Mobile as an online-only version of their cellular service. In other words, there are no storefronts – you do everything online. It’s also only a provider of SIM cards and service. There is no “free cell phone with a 2-year contract” option either. You need to bring your own phone to Mint, but you get to choose what phone you use. They do offer phones for sale on their site with at retail price. If you buy a phone from them, you’ll get 3 months of service for free, with comes out to about a $60 bonus. A set amount of data based on your plan. These rates are for a 12-month contract. Add on $5 if you switch to a 6-month contract, or $10 if you want a 3-month deal. You can start with any of the above, then switch easily too. I started with a 3-month plan to try them out, then bought a year once I verified everything was working. I just renewed for my second 1-year plan in December. 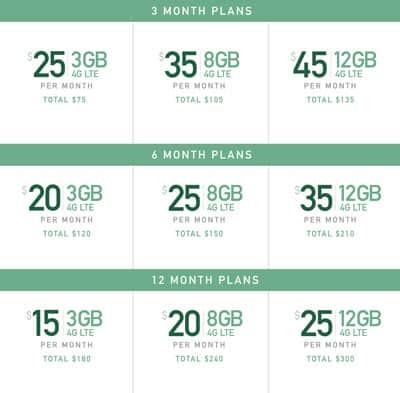 Note: As of January 29, 2019, Mint Mobile increased their data tiers from 2/5/10 GB to 3/8/12 GB. Mint Mobiles Updated plans as of 1/29/2019. I think starting with the 3-month 12 GB/month plan is a great way to try Mint out. For $75 for 3 months, it was still less than a single month of service with AT&T. In December of 2017, my 3-month contract was up and I decided to keep things going with a 12-month plan @ 12 GB a month. For $300, it was still 25% of my AT&T bill. If you know how much data you use each month then choosing a plan should be a breeze. If you don’t, try looking at your bill from last month. It should list out how much data you’re using and you can plan accordingly. In order to use Mint Mobile, you’ll need to have an unlocked phone. Having an unlocked phone will allow you to install a new SIM card on any network your phone works with. If you purchased your phone through your carrier (say Sprint or AT&T) then it will usually start off locked to that carrier. That means you can’t change the SIM card until you have fulfilled your contract and they allow you unlock it. After 2 years with my AT&T iPhone, I realized I could put in a request to unlock my phone. It took them 9 whole minutes between when I filled out the form and when my phone was unlocked, although they say to give it 24 hours just to be sure. This process used to be more tedious, but now it’s so commonplace it’s the easiest part of switching (assuming you’re out of contract). Once they’ve toggled that setting and unlocked your phone, you’re good to buy a new SIM card and change networks! You select your plan on the MVNO website. They mail you a sim card for your phone. You let your current carrier know you’ll be transferring. Replace your SIM card with Mint’s SIM card. Finalize the settings on your phone. One thing I ran into was that the “help” number that I dialed went to Mint, when I thought it would go to AT&T. If you want to talk to your old carriers help desk, make sure to put in your old SIM card, or follow these instructions on how to activate your phone. What is the Mint Mobile Network? Mint uses the T-Mobile network, so if you know of any issues with them in your area you’ll experience those same issues with Mint. The T-Mobile network has the second best network here in the US, which is a great sign if you don’t yet know if it’ll work in your area. You can check out the T-Mobile network map and verify it works where you need it. Mrs. Minafi was previously on AT&T when I was Mint, and whenever she had service I did as well. There were times when her phone found a signal faster than I did, but I believe that was due to my old iPhone 6 going against her new Android (yes, we’re a divided home when it comes to mobile OS’s). We did hit some rough spots on a car trip to southern Utah where were were in the middle of nowhere. For those areas both phones on Mint and AT&T couldn’t get service. While Mint is great for in the US, it’s not going to be your best friend if you’re traveling abroad. If you’re outside the US, then you qualify as roaming. At which time, you’ll need to add “UpRoam” credits to your account. There’s nothing here to denote what you’ll get for that $20 unfortunately. For that you need to do a little research. Mint’s International Roaming Rates are $0.20/MB outside the US – except for Mexico and Canada where you’ll pay $0.06/MB. $0.20/MB is a LOT. Checking Facebook will likely cost you a buck or two. For our 7 day trip to Scotland and England, I bought $20 of UpRoam credit. I used it for absolutely nothing except for the occasional Google Maps and Lyft/Uber to get around. At the end of 7 days, I had about $3 left. If I were actually using the internet it would’ve been gone on day 1. When we were in Southeast Asia on our honeymoon, I realized that Vietnam and Laos weren’t areas that had ANY service. Cambodia surprisingly did allow cell service, and the option to pay for data. Honestly, if you’re going international there are better options. Mrs. Minafi switched to T-Mobile which offers unlimited 2G data in 210 countries as part of their $80/month plan. They also offer tethering, which has allowed us to share her phone in times of need. If 2G is too slow (and it often is), then we prefer to rent a pocket wifi wireless hotspot from Tep Wireless. We’ve used them Japan and Europe before and have been big fans of the service for the price. For about $9/day you get unlimited bandwidth for on fast speeds that up to 5 people can connect to. One thing that comes in extremely handy is tethering. Mint allows tethering for free, with any bandwidth going against your plans limit. For the last year, I took the train to work. Occasionally I’d tether and get a little work done from my laptop on the commute. It also comes in handy when we’re traveling and don’t want to pay exorbitant hotel wifi rates. If you are connected to wifi, Mint Mobile supports Wifi calling on most phones. This is handy, especially when you’re international. Also, Mint recently rolled out visual voicemail! This allows you to see a transcript of a call message left for you right from the phone. This has been extremely handy for dealing with spam calls for me, as I can just read a few lines and delete the calls without listening to them. If I want to listen, I just click on the call and listen – no need to call up a service and navigate through a series of menus with “press 7 to delete” options. Mint runs occasional specials, but with enough irregularity it makes it hard to plan for. Most of the deals are only for their introductory plans too and won’t benefit you if you’re already a member. Ebates does have a few coupons for as much as $10 off your initial month. Better than nothing! Mint Mobile is an excellent deal for the money. Getting 10 GB of data for only $25/month is an amazing deal, and absolutely worth it for me. At $300/year, the cost is about $900 less than AT&Ts highest plan. Mint Mobile Unlimited Calculator gets real. If you’re on an unlimited plan with another carrier and are concerned about going down to a finite amount of data, I’d encourage you to see exactly how much data you’re using. Even if your data usage is above 10 GB, try connecting to wifi whenever possible and see how that impacts your end of month numbers. If it’s under 10 GB, you might be able to save yourself some serious cash! Are you able to turn off the plan for a month if you’re traveling abroad for example? I usually just buy a local SIM card when I’m in Europe and that works great. I’m currently on ATT’s prepaid plan – 45$/mo for 6 MB but I just called and realized I’m using less than 1 GB per month so I’m going to switch to their 35$/mo plan. But I may switch to mint mobile once I ask around about how service is for TMobile- I live in a rural area. Yep! International data is disabled by default, so unless you pay to buy some intl data and then enable it, data won’t work when you’re out of the country. For me with an iPhone, I had international data disabled most of the time. Then I’d turn it on to use a specific app then disable it.